You can check if a person is licensed to represent immigrants or to give advice. Immigration Consultants of Canada Regulatory Council. If they are not members in good standing, you should not use their services. Most law societies let you check online to see if a person is a member in good standing. Very happy to help couple of my clients who are lucky to use AIPP!!! The Atlantic Immigration Pilot is a partnership between the Government of Canada and the Atlantic Provinces to attract and keep skilled immigrants, as well as recently graduated international students from Atlantic universities and colleges, to meet the unique workforce needs of the region. As of July 2017, more than 280 candidates have been recruited. Of these candidates, more than 200 have been endorsed by an Atlantic province, the first step in using the Pilot to immigrate to Canada. Best wishes to all proceeding to second step in application process!!!! Canada #1 International student destination as well like immigrants!!! Number of Overseas Students in Canada over past 5 years. And following countries are top suppliers of international students. Anyone who would like to file for Student visa for Jan 2018 intake must do it as early as possible since many of the students I filed for in the last week of July for Sept 2017 in take are keep calling me as we are still waiting for a final decision by IRCC. So like always , I would want you guys who are aspiring int’l students please expedite. Please don’t wait for the last moment.And If anyone don’t get a visa approved before college enrollment deadline, they will not be joining their planned intake and repeat the process from the beginning or start the process all over again. Students in Ontario must now focus on OINP ? New OINP Pilot: Employer Job Offer In-Demand Skills Stream. Ontario’s Provincial Nomination Program about to introduce a pilot program under the Ontario Immigrant Nominee Program. This stream is for applicants in certain NOC occupations in the construction and agriculture sectors, and will be ready to launch shortly. The ministry is currently checking and finalizing the system. The job oriented PR is a golden opportunity for workers in construction and agriculture industry to immigrate with job offer. The specifics (trades in construction and agriculture) of this program is only going to be announced but eligibility can be determined since that info is available. This is a PR program only with a genuine job offer from an eligible employer in eligible NOC codes. – Applicants can apply only if they have received a permanent and full-time job offer from an Ontario employer, in a specific occupation, and have a completed and signed Employer Form. – Language: CLB 4 or higher (English or French). – Education: Minimum equivalent to secondary school in Canada, confirmed by an Educational Credential Assessment. – Work Experience: 12 months full-time in Ontario in the last 36 months. – Settlement Funds: Minimum level of savings or income in Ontario for the applicant to support themselves. – Certification: As required for specific occupations. Anyone in the above two sectors who meets those eligibility requirement can contact us on info@ciisimmigration.com for assistance with application filing. Important note: This is an employer job offer stream and applicant need a job offer and should meet all other eligibility criteria before filing for Visa. How Canada became an education superpower? 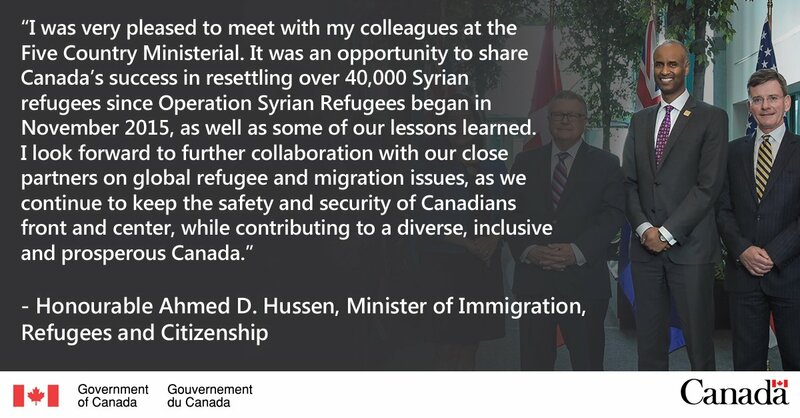 IRC Minister met with int’l partners to share and exchange trends and info on immigration. 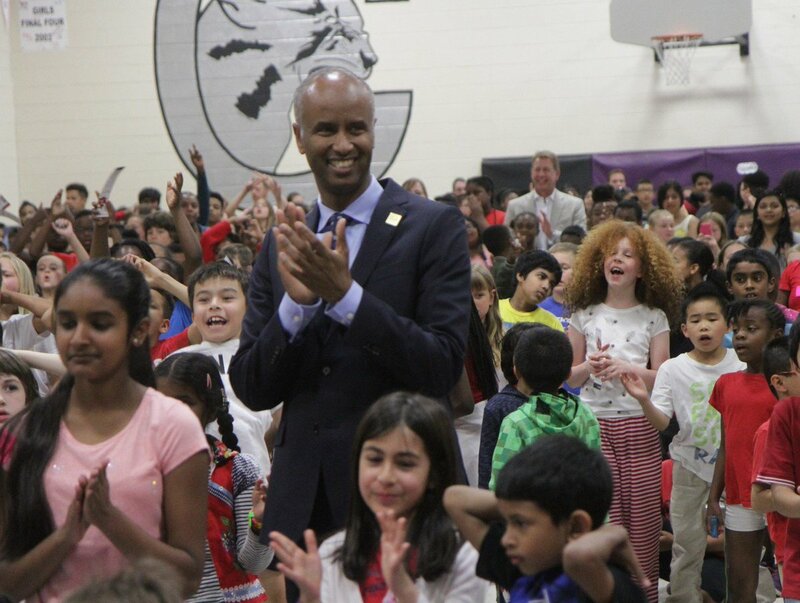 On July 1 the 150th Canada Day minister for Immigration Refugee and Citizenship Ahmed Hussen leads reaffirmation and Congratulates. ETA is now in effect.